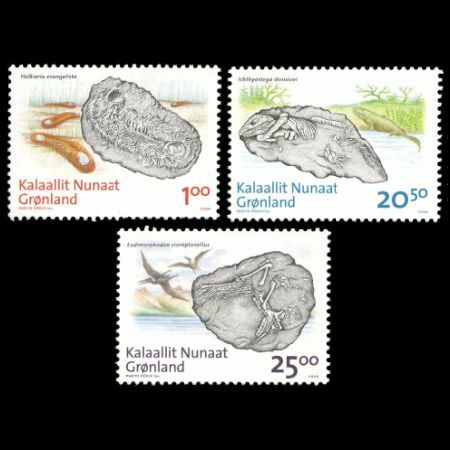 A new series of a total of six stamps with greenlandic fossils is now brought to light. 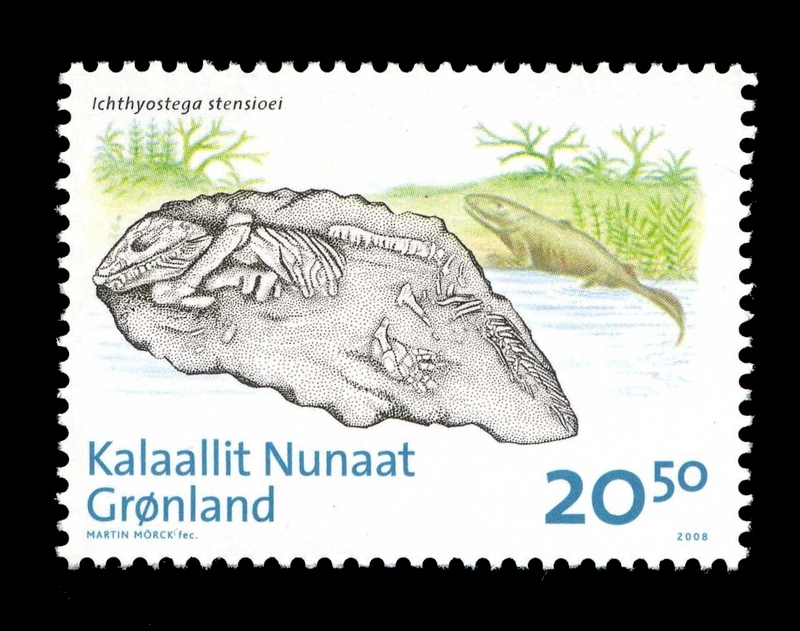 The illustrations and the engravings are made by the Norwegian Martin Mrck. 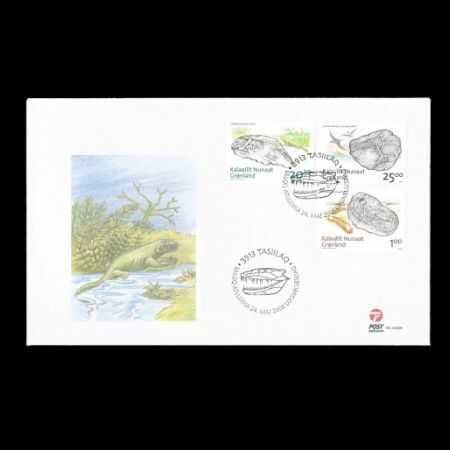 The frst three stamps of the series are issued on 24th May, and the remaining three in 2009. The geology of Greenland has a remarkable large number of rock structures that stretches over almost four billion years of history of the Earth. In fact, sedimentary deposits from Isua in West Greenland reveal the earliest proof of known life, in the shape of micro-organisms, existing 3,8 billion years ago. 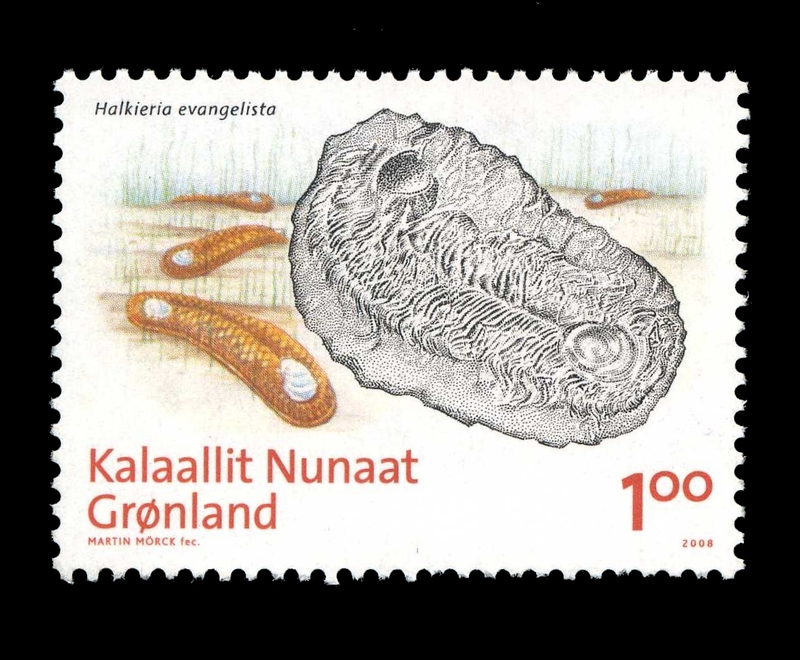 Life developed later in species and numbers and left its marks on geological history. Rocks and fossils in Greenland have given us an insight into the development of animals and plants throughout the history of the Earth. 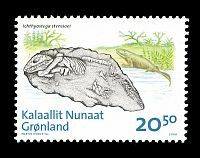 The frst series of stamps on this subject illustrates important events in life on Earth by showing unique fossils from Greenland. In the geological Age, Cambrium, a riot of different species arose, which later lead to the inhabitation of the earth and the sky by toads and pterodactyls respectively. Halkrieria evangelista is an astonishing animal. It looks like a worm with two shells, one at each end of its body. It was frst found in Cambric rocks on Bornholm; only a few shells were found which, for the most part made it look like a sea shell. 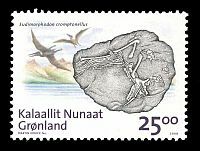 The fossil from the Pass of Sirius in North Greenland was collected by The Geological Institute of Greenland in 1980. The fnd was complete with two shells and it showed that it belonged to the mollusc but it did not look at all like something we know of today. The fauna of Sirius contains many strange and undiscovered animals and that testifes to a world-wide development of new kinds of life, e.g. during the Cambric Explosion 250 billion years ago, when a high amount of new complex organisms developed very fast. Ichthyostega stensioei is one of the frst amphibians. In the geological age, Devon, the land was already green and contained different species of spiders, insects and molluscs. At the end of Devon about 360 millions ago, the vertebrates followed. 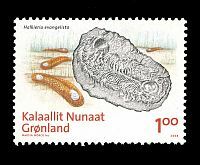 The frst specimen of Ichthyostega was collected by Swedish expeditions in East Greenland in the 1920ies and 1930ies. At frst it was taken for a terrestrial toad, but later it came to show that it lived in water; however, sometimes it would pull itself ashore, where it most likely fed on insects. 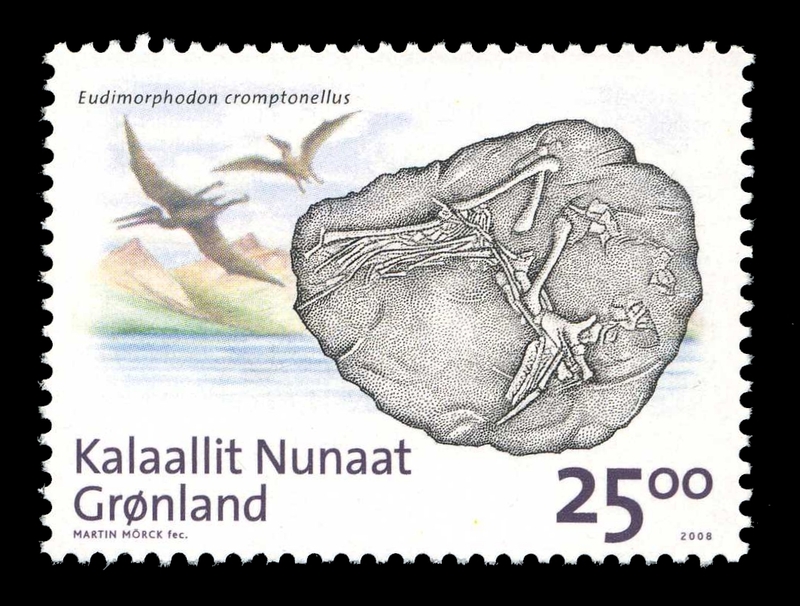 Eudimorphodon cromptonellus is a small pterodactyl that was one of the frst vertebrate to develop the ability of fying. the same time as the frst dinosaurs (such as Plateosaurus), toads, fsh and mammals. The sky was crowded with fying insects and hovering lizards but proper pterodactyls were the frst to develop fying at own force in Sen Trias, 220 billion years ago.The mentioned fossils are to be found at the Geological Museum in Copenhagen.